WIN Detergent is specially formulated to get persistent, sweaty smells out of the synthetic materials used in today’s workout apparel. Synthetics are great because they wick moisture away from your skin. But those same properties trap and hold onto oils. Those oils bond to the fabric, and that’s where the stinky smell comes from. WIN is optimized to break those bonds, removing the source of the smell and truly cleaning the garment. The result is your gear not only smells great, but it works a lot better without all those oils in the way! So, what was my experience? I’ve used WIN about four times (both the regular and the green bottles – green is dye and fragrance free) in the past month or so and the first time I pulled my clothes out of the water, I was impressed. It just works – my running and workout clothes were so fresh. I was a fan. I can’t speak to the oils on the fabric because that’s something I’ve never noticed, but in terms of smell — this stuff works. Comment below and tell me if you’ve ever heard of sports detergent. I’ll pick a winner using the random number generator and the winner will be posted Thursday. 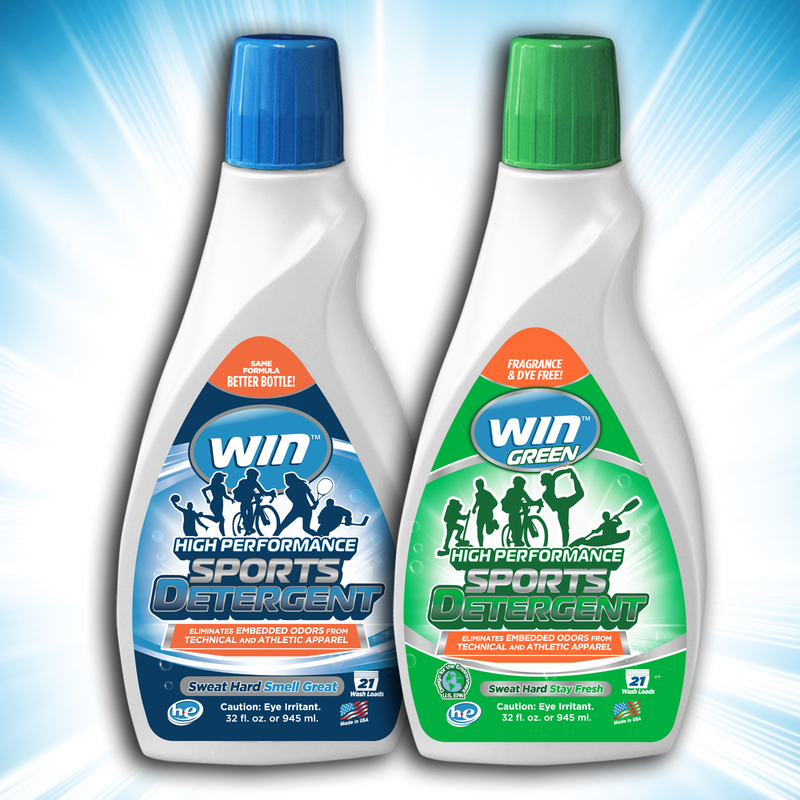 I recently just heard of sports detergent a few weeks ago, bit I’m very interested in trying it. My running clothes need it! Kimberly recently posted…How Running Makes You Younger! This made me giggle. I don’t have special sports detergent, but I do make sure to wash all my synthetic stuff by itself (no cotton in the load). It started with my lulu stuff, but I read somewhere that it’s better for the fabrics so that’s what I try to do. Anything that makes laundry easier/less smelly is a great idea. I’ve heard of WIN and know people who love it, but I have never used it myself. I’d love to check it out! Never used a sports detergent before, but I probably need to. I have been hoping to find such a product! I’ve tried the Sport Tide but I think it masks the smell and we have 1 shirt I just can’t get the smell out of!